On a cold and rainy day The Family and I made a pilgrimage to an unprepossessing bridge in Berlin where I’d wanted to be 27 years and 51 weeks ago. On the night of 9th November 1989, I sat in Aachen and watched people pouring through an open gate in the Berlin Wall and across this bridge in Bornholmer Strasse. We had a meeting the next day, but I spent the night on the street discussing with friends and strangers whether we should just leave and go to Berlin. The Family recalls watching TV in the US, with channels looping visuals of frenzied crowds breaking through the Wall. It took us so many years to finally get to this spot. Berlin was a dream; one of the few dreams which come true. When I first came to Germany, Berlin was a divided city. Then, the urban transport network of West Berlin passed through ghost stations which were locked up and did not work. If you took the underground from Moritzplatz in the Kreutzberg area to Gesundbrunnen station, you would pass through six stations where you could not get down. Now every one of these works. 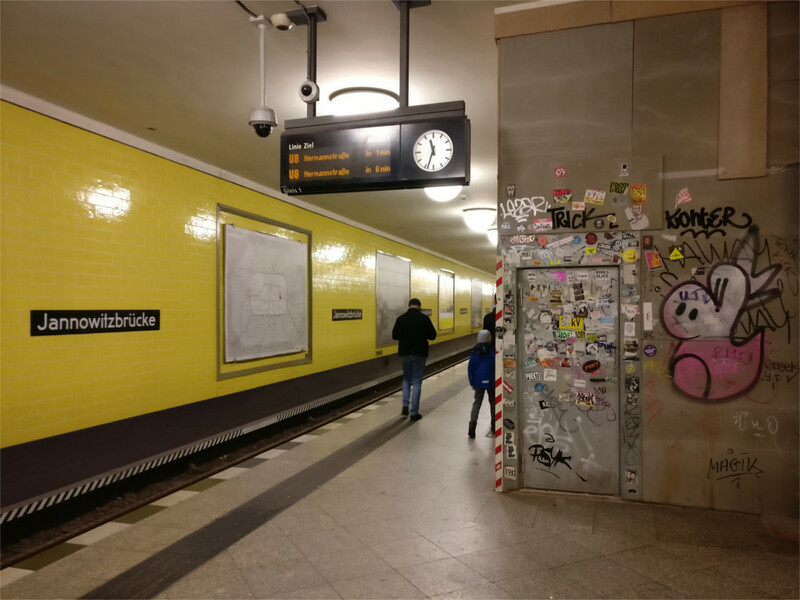 Anyone can walk off the road into the following stations and catch a train: Heinrich Heine Allee, Jannowitzbruecke (as you can see in the photo above), Alexanderplatz, Weinmeisterstrasse, Rosenthaler Platz and Bernauer Strasse. So, I did. What a lovely feeling to walk through this undivided city which, in one generation, seems to have forgotten its dark past. Walking in Berlin today, one has the feeling that all problems can be solved and all walls broken. An event to remember – we were there the year after, and it was amazing to see all the happy people and all the remains of the wall. The happiness seems to have faded a little bit, but it is more normal now.